Yeah, these chocolate muffins are healthy, but guess what? They are also out-of-this-world rich and tasty! I actually like them more than regular muffins because they’re super moist, and on top of that, they are REALLY easy. In fact, you might already have all of the ingredients on hand. You can read my full post and instructions here, but here’s the simple run-through. 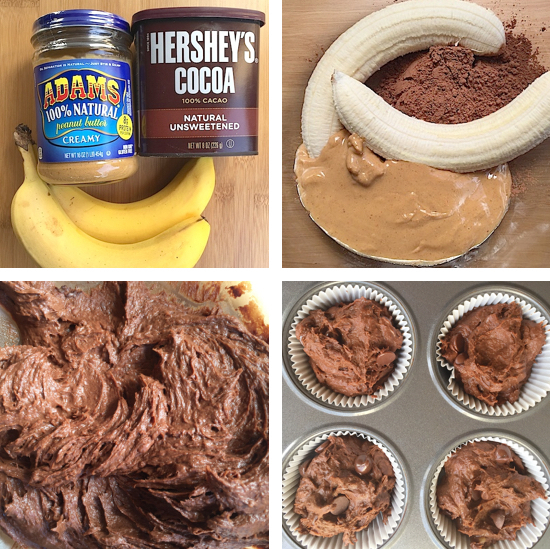 This recipe will make 6 heavenly muffins. Use a hand mixer or food processor to combine all of the ingredients (except for your optional mix-ins) until well blended. Use a spatula or spoon to fold in a handful of chocolate chips or walnuts if you’re using them. Fill 6 cupcake liners evenly to the top. These muffins will not rise like regular muffins, so don’t worry about filling them too high. Let cool, and enjoy! They’re like sweet, sweet heaven, and without any of that evil sugar or flour. In fact, you might think they taste more like brownies than muffins!